The Apollo Ideas Blog is a free resource for our advice and thoughts on presentation design and delivery. iPad is a presentation game changer. Since its launch four months ago, Apple has sold roughly four million units and they're only just now rolling out to international markets. iPad is a solid success and the harbinger of a major computing paradigm shift. It inspires us to imagine new ways to approach presentation design and rethink the role a presentation can play in business communications. iPad is the killer tool for the one-to-one presentation. It can connect to a projector like a laptop, but it really excels as an interactive device. iPad transforms a normally passive activity into an engaging experience. The multitouch screen means your audience can hold your slides in their hands. They can flick and tap their way through your content. They can interact directly with your ideas. In this new paradigm, a presentation can be approached as an interface rather than a slideshow. Buttons can replace bullet points. The slide order can change for each audience member like a "choose your own adventure" story. There's no "best way" to create an iPad presentation, but there are several new ideas forming as the technology is explored. 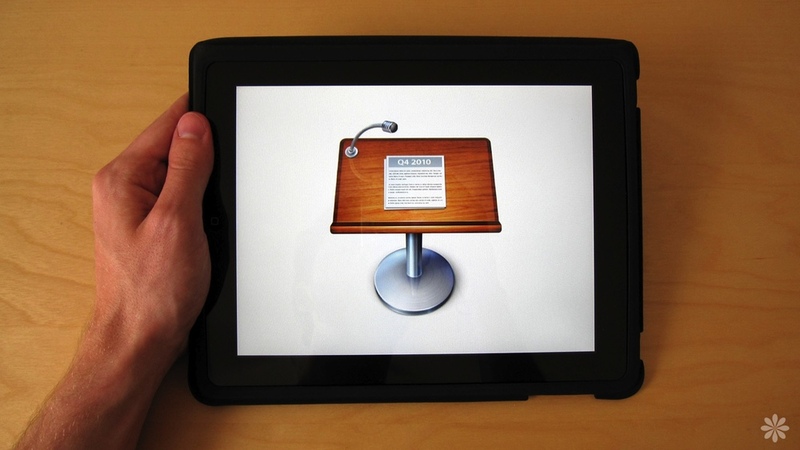 Here are a few types of presentations iPad can make better. • Improved sales meetings - Instead of sitting across a table with your laptop, let your client hold your slides as you deliver your pitch. • Dynamic product catalogs - Instead of bland spreadsheets listing products, offer your client an interactive digital catalog. Clients can touch their way into each product category and interact with each product through rich media and vivid descriptions. • Seamless kiosk presentations - Instead of a computer with a keyboard and mouse, let your guests touch their way through an interactive presentation. Think about how slick a row of mounted iPads would look in your trade show booth. • Gorgeous design portfolios - Instead of flipping through cumbersome Photoshop and InDesign files on a laptop, let your client flick through a dynamic, interactive portfolio. They can even see live mockups of your site. • Quick app prototypes - Instead of static wireframes, create an functional prototype of your app, all in only a few minutes. There's a great video tutorial for this here. What other ideas for iPad presentations are out there? Please share some of your ideas in the comments. An Empty Canvas - A beautifully written article from the folks at Cultured Code. The source of the quote above. Web design for the ipad - Tips for designing websites optimized for iPad. Good ideas for presentation design too. iPad App Prototyping - How to make an app prototype using Keynote on iPad. Apollo Ideas is a presentation design and strategic consulting firm that empowers communicators around the world with clear, simple expression.